A couple of windy hunts with not much bird action but lots of pretty stuff to look at. Leslie’s photos add spectacularly to our videos, I think, and to this blog. I’m grateful she wants to go chukar hunting with me, even though while we’re out I almost totally ignore her. To use my friend Peter’s phrase, it’s symptomatic of how hunting underscores “the strangeness of being who one is” (see his excellent book, Making Game). In one of the rare moments during a hunt when she and I are actually walking together (she stays behind to minimize the chances of me shooting her), Leslie asked me if I think about other things when we’re chukar hunting. I said, “No, that’s probably why I like hunting so much.” It’s not that I think much when I’m not hunting, but that it’s the purest form of doing something I get to do frequently. Playing music comes close, but the ear often interferes by letting you know when it’s unforgivable crap, and then the musicking becomes a vehicle for self-loathing. But that’s another, super fun, story. Anyway, here are some of Leslie’s lovely photos from our past couple of hunts. Speaking of strange, we experienced an unprecedented moment on our hunt yesterday when a coyote we flushed flushed the only covey of chukar we saw in five miles of hiking. Leslie got it on video (see below; you might have to replay it a time or two to see it unfold). As always, fantastic stuff Bob and Leslie. I especially liked seeing Angus jump over the hill as if to see where that chukar was going. Like my dogs, the higher they get the easier it is to see where they go. I just got back from Oregon with my grandson. 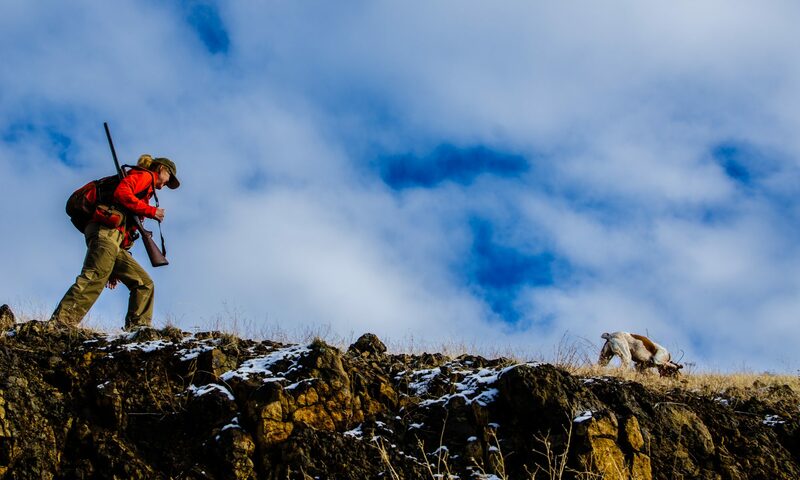 If Leslie would have been along , I think we could have made a documentary on the thrills of a 12 year old with a pointing dog on steep chukar hills. The points were plentiful, birds cooperative, and Conner finding out that shooting off side hills is not and easy thing. Thanks for the great pictures and video. Great post. A friend of mine has been battling PTSD for quite some time, and he says hunting is the only way for him to get out of his own head. Its an uphill battle for him to get out of the house and into the field but once he is there, he claims to be free. He likens it to taking his brain out and letting it get all the leg room it needs. That allegory seemed appropriate, since I have always felt that when I am out focusing on my dog and the country side there is some deeper connection between us that leaves little room for everything else if I am lucky. As for “Making Game” I don’t know how it slipped under my book worm radar but you had me at “Symptomatic”, Im going to order it pronto. That’s a poignant story. Wow. I hope you enjoy Making Game – it’s truly a unique book (as is its author).